A Dose of Caffeine a Day Keeps Hairloss at Bay! Have you wonder how does Caffeine helps in Hairloss? The Plantur 21 and Plantur 39 hair care range by Dr Wolff have recently launched in Singapore, providing Singapore women with an affordable and effective solution for their hair loss. Dr Wolff Research found that caffeine is effective in countering growth suppression and have developed their own phyto-caffeine and nutri-caffeine complex. The active ingredient complex protects the hair roots from premature exhaustion and thereby counters the problem of hair loss by providing the hair roots with sufficient energy to grow. I have tried and will be reviewing Plantur 21 in this post, read on for my review. For younger women experiencing premature, possible hair loss triggers can be due to burdens such as mental or physical stress (exam stress, competitive sports, lack of sleep, shift work, stress through family and/or job) as well as nutrient deficit due to an unbalance diet or weight loss diet. The activating nutri-caffeine complex in Plantur 21 will help to recharge the hair roots by penetrating the hair root where it can unfold its stimulating effect during hair wash. The unqiue galenic formula of the shampoo allows for the powerful Nutri-Caffeine Complex to start penetrating the hair follicle even during hair washing. The Plantur 21 can be detected at the hair root after just 120 seconds of residence time. The Nutri-Conditioner contains micro-nutrients and caffeine which prevent the valuable ingredients absorbed during application of Plantur 21 Shampoo from being rinsed out. The Nutri-conditioner is specially developed for dull, colour-treated and stressed hair as it contains fruit acid and active avocado ingredients that help strengthen the hair structure and smoothen the hair surface. The Plantur 21 scalp tonic provides protection from an energy deficit in the hair roots, thereby preventing premature hair growth distruptions. The active ingredient complex travels along the hair shaft and forms a 24-hour active ingredient depot in the scalp. 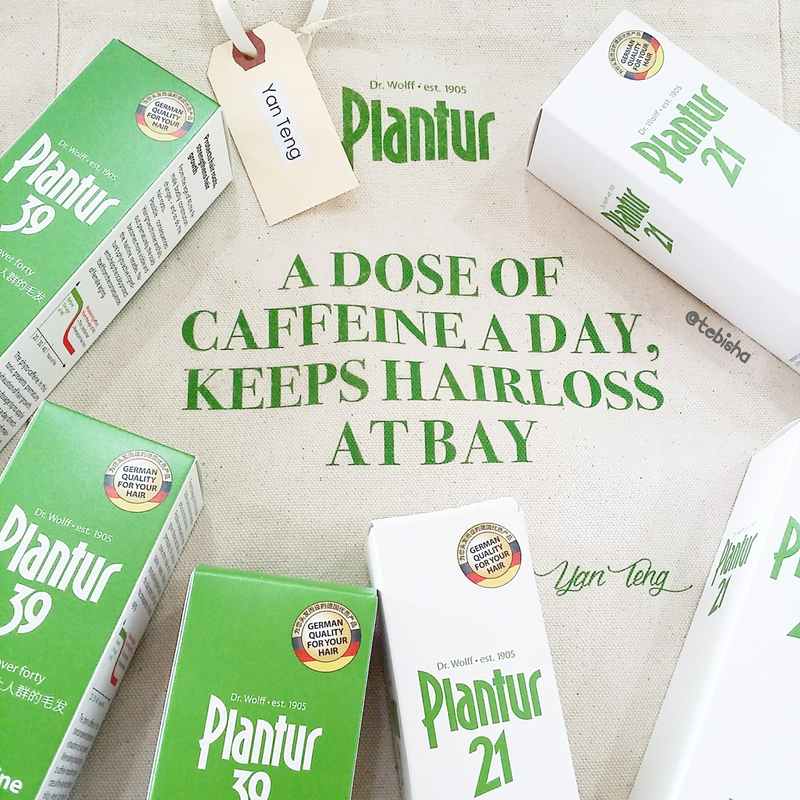 The Plantur 21 Nutri-Caffeine Elixir should be applied to the scalp once a day and should not be rinsed out. Tips: Apply daily to continuously provide the hair roots with sufficient energy and prevent hair loss. Reviews: I have a very sensitive scalp, not all the shampoo selling in the market I can use. I will encounter itchiness and redness on my scalp if I use an unsuitable hair care range. Plantur 21 is one of the hair care range that helps me to soothe my scalp. As you can see from the picture below, I do have flakes appearing and redness on my scalp. All these will occurred when I used an unsuitable shampoo. After using Plantur 21 range, flakes have disappeared and redness has been reduced. Highly recommended to ladies experienced the same issue as me and ladies who are having hair loss problem. Plantur 39 hair care range is for ladies who are 40 years old and above. For fine and brittle hair. Plantur 39 is specially forumated with phyto-active ingredients that protect the scalp from the consequences of menopausal hair loss. Thanks Laura for sending the press kit over. Do give Plantur 21 and 39 a try, prices are very pocket-friendly. Both range are already available in selected Watsons, Guardian, Unity, NHG pharmacies and independent pharmacies as well as NTUC Fairprice, Cold Storage and Giant supermarkets island-wide. Thanks Plantur & Golin for the products! Do you known if it helps in bald patches too?